Weekend following the Al-Ind-Dusk-A-Sea dive we were back in Lake Washington for a dive on the whaling ship Fresno. 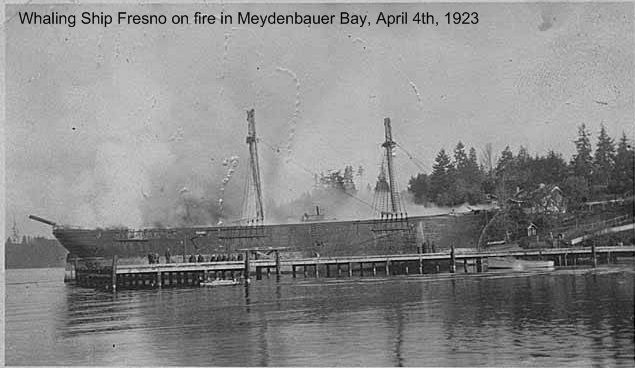 The black/white photo included below is of the Fresno on fire in Meydenbauer Bay on April 4th, 1923. At the time, three other whaling boats were pulled safely away from the dock and away from the burning ship after the ferry boat Leschi was unable to pull the Fresno free. Eventually a tug succeeded in towing her out to the middle of the lake but the ship was allowed to burn as no equipment was available to extinguish the flames. The photo is from the Collections of the Eastside Heritage Center. Once the flames burned themselves out the Fresno was deemed a total loss. They filled the ship with rock and sunk her in Meydenbauer Bay where she now sits on the bottom, 180 feet below the surface. 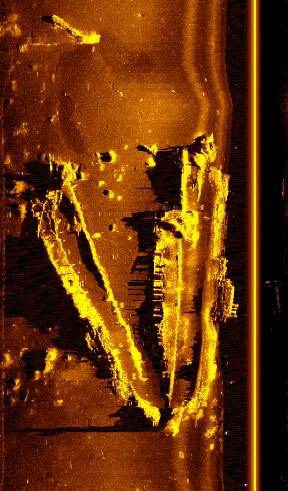 Also included below is a sidescan sonar image of what the Fresno looks like today. The hull of the vessel is broken apart right along the spine and rests into two distinct pieces connected at the stern. I suspect she sunk to the bottom stern first then broke apart on impact – and that is why we see separation between the hull structures. The rudder of the ship appears as a long thin shadow in the side scan image. Also visible in this image are the remains of the rigging (about half way down the hull on the starboard side – the section in the top half of the photo). For our dive on the Fresno we dove as one team of three and one team of two. Visibility in the shallow depths was great, which meant the very limited visibility we encountered on the bottom was expected. We had to tie a reel into our anchor line and run cave line while touring the ship. Running the cave line was the only way to ensure we could get back to that anchor line, our “up” line, in the limited visibility. We planned for a long bottom time, so we carried stage gas in an 80 cu ft tank in addition to the double 104 cu ft tanks on our back and the two 40cu ft deco bottles of 50% and 100% oxygen. We used 18/45 (oxygen/helium %) for our stage and back gas. After a cold 30 minutes on the bottom we headed for home which meant another 60 minutes in decompression back to the surface.